I was the introvert type before I started climbing. My friends were just Leo Tolstoy and Jason Mraz. Then one day in the year 2005, a friend back in grade school invited me to go hiking. Jeff, who had been a mountaineer for quite a while, just overheard me mention the name ‘Mt Pulag’ at our town’s fiesta celebration here in Manila. Back in high school, Jeffrey Dandan was the cool, hot guitarist and I was just the nerd. Our worlds never collided then. But when people get older, our different potentials come out and are actualized. Climbing, it turned out, was our ‘common ground’. 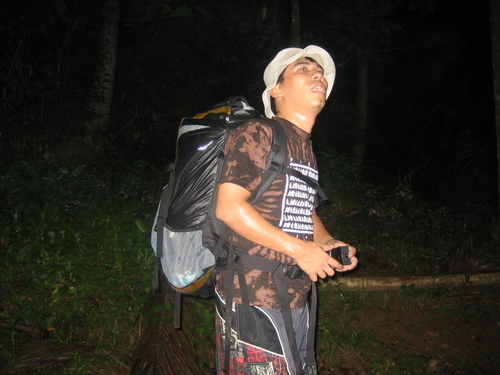 So on August 13, 2005 he led my first step on the trails of Mt Romelo in Siniloan, Laguna. It was a stormy night! We took the Raymond bus in Legarda. At the terminal I was amazed by how mountaineers, strangers as they may be, coolly interact with each other. They throw this aura of familiarity in the air as though they had known each other for ages! Jeff never really gave me a rigid orientation or introduction to Philippine mountaineering more than the 12-page printout of PNB-MC BMC. And that bus terminal was Chapter 1 in my mountaineering book. There, I learned the basics of Philippine mountaineering parlance! Through Jeff’s conversation with Louise de Guzman at the terminal, I had the terms ‘SER’ (not Sir), ‘magkano SCORE mo niyan?’, ‘TRAVERSE’ and ‘SOCIALS’, among others, in my lexicon! After around two hours of the early morning bus trip, we were at the jump-off. This trek was Chapter 2. Although sleepless, I was filled with excitement at my first communion with the Philippine back country! And my battle cry was “Yeah, I’m Wet, Wild and Dutty!” The mud was knee-deep but it felt good to sweat and get soiled. And trekking at night added to the thrill of the adventure. My exhaustion during the first ten minutes of the uphill trek was my cue to have a sip of my Lipovitan! Sooner, the thick slippery mud of Mt Romelo would show me my first mistake. Just like most first-timers who start with sandals before they are willing to shell out more than three thousand pesos for a pair of trekking shoes, I was attracted by the blue and white color combination of Tribu’s Urban Mangyan sandals. Now tell me you didn’t make the same mistake! Try using those sandals on a muddy trail and you’ll know what I mean by ‘mistake’. As the name suggests, they’re for urban use! Chapter 3 was this incongruous dialog between me and Louise de Guzman. When we caught up with their group at the resting hut before ‘peak 2’ he asked us “Ser may napansin ba kayong lalagyanan ng tubig sa peak 1?”, In my effort to join the atmosphere of familiarity I blurted out “Oo ser! Naiwan niyo ata dun!”. Dumbfounded and amused by my dumb answer, Louise could give me no more than this impish grin behind his remark “Yun nga ser!”. I didn’t know that his innocent question actually translates into “Did you bring the water canteen we happened to leave at peak 1?” Lesson # 2: Don’t try to sound like you’re a seasoned mountaineer. Just shut up, watch, listen and learn! Name-dropping and mentioning mountains (you haven’t climbed) won’t help either! In other words, trying to be Mr. Know-it-all won’t convince experienced mountaineers that you’re one of them! Trust me! It’s obvious. There’s nothing wrong with being identified as a newbie! We all start with our first step, after all. Don’t run when all you can still do is crawl! But that dialog was actually the fuel in my succeeding treks. That mocking grin was my inspiration to be “one of them”! And I reached the farthest and highest reaches of the Philippine archipelago because I took the remark not as an insult but as inspiration and challenge! Me and Louise became good friends and I joined his group in two more climbs that followed my first climb. I still have the malong that he gave me that day! He owes me one booze-up and I’m collecting when he’s back in the country this summer! Chapter 4 is of magic, myths, thieves and a dog! When we reached the campsite, there were already four boys who had camped the night before. Mong, Cheng, Eric and Gian belong to a basketball team named Kuligligs (in Brgy. Punta, Sta Ana, Manila). Jeff decided to pitch his dome-type tent beside that of the Kuligligs. Louise’s group camped at the other side of the river! Night fell and I was introduced to the most indispensable part of climbing Mt Romelo—SOCIALS! We drank, laughed and sang at Louise’s camp! And it was also then when the tent of the Kuligligs was taken away by midnight thieves along with their money, clothes and other stuff! Our tent was spared thanks to the dog which accompanied us from the registration and slept at the door of our tent! 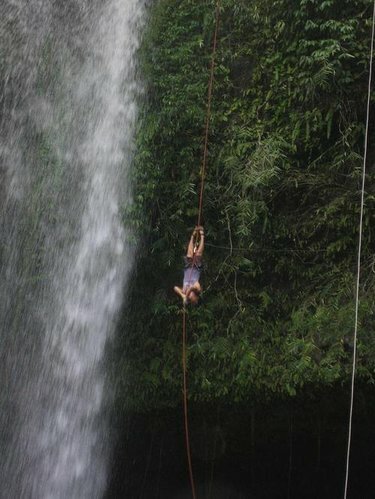 The following morning, we rappelled alongside Buruwisan falls courtesy of Louise’s group! The Kuligligs had decided to head for home! On our way back to the campsite, I found the Kuligligs’ belongings on the trail. I found Mong’s shirt which he eventually let me keep and their coin purse containing their fare back home. Talk about an enchanted waterfall! Apparently, they fell out of their tent while the thief was carrying it down the Buruwisan trail. I gave them their money back when they invited me to their place in Punta during Eric’s birthday celebration the month after the climb. And that’s how Chapter 5 was drafted! Out of this nasty robbery, my friendship with the Kuligligs was forged. They became my constant companions in the climbs that followed. Gian and Mong were my buddies in my first attempt on Mt Tabayoc back in 2006. Mong and Cheng were with me during our mighty Timbak-Tabayoc-Pulag expedition in 2008 which I dubbed as Luzon 3-2-1! Making friends with strangers is probably the best part of Pinoy mountaineering. With these strangers-turned-friends you’ll decide to form your own mountaineering group and give it a name. It’s a good thing that we decided not to call our group any name. It has lasted 6 years now! Mong is now busy working as security personnel. Cheng is now a regular employee at PHIMCO. Eric is busy sending his siblings to school and Gian is now in the States. We’re starting to drift apart but our memories are the mystical bond that keeps the companionship and the spirit of camaraderie alive! This first step was followed by a thousand more steps that led me to the mountains in Luzon, Visayas and Mindanao! Along the way, I met more and more friends and more and more places that make a man want to say goodbye to his carefree wandering and finally settle down! But climbing is my life and whenever I stop, my feet can’t wait to start trekking again! And I end this article with a hope that your first step won’t be your last! Start Exploring and Never Stop! Thanks Sir Gian! Yeah, I will! I already have a subject in mind. I need more reading to influence my writing style!hehe We miss you here dude! Thanks Sir Daile! And everyone should know that, my first steps were also guided by Sir Daile's multiply page! I was already a big fan of Sir Daile's even before I bought my first mountaineering gear. Wow! very inspiring first step. Just from the word "Pulag" adonis turned from books into mud. Actually i can't connect the dot how did a nerd get interested in mountains which basically dirty, tiring..etc etc. yeah i agree with you..when people get older "different potentials come out and are actualized"
you were hooked in mountaineering since then. While i was reading some of your blogs I found out that it's really easy to make friends up there huh! congrats..
Ang saya ng experience ninyo ser!aydoL!yung first climb ko din Tribu sandals gamit ko pati first major climb ayun nagka-knee injury.Hihi.after nang injury na ako bumili ng sapatos. Very inspiring ka talaga ser! hahaha...but that's a sweet lesson learned. at hahayaan din lang natin ang ating mga kaibigan na matuto by making a mistake. : ) hiking is more fun in the philippines! Salamat uli. Busy lang sa work kaya di makapagsulat. Dami ko nang nakapatong na articles for final editing. sir :) a special friend of mine told me read this article. inspirational na nakaka motivate pa :D same as you, i was once had an introvert type of personality, but mountaineering changes me alot, as in alot! and tama ka na after a climb, na ngangati agad ung paa ko na umakyat ulit, kaya naman nkapag 3mountains aqo in month na hnd ko namamalayan >.< hahaha super nakaka relate po ako sa lahat ng articles mo, lalo ung tungkol sa mga solo girl back packers; si Ms. Kat ocol, etc. till here!!! a million thanks po :) godbless!!! The fun and the adventure of my first step would never give any excuse not to write. Thanks for dropping by. Feel free to share your inspiring stories and send 'em to lagataw@gmail.com. I've been really busy lately that I haven't been posting regularly here. A good random read, Sir Adonis.